Issues related to water management in the mining sector vary from one site to another and must be addressed locally. Water is mainly used for treating ore and recovering metals as well as for controlling dust particles. It also used to meet the needs of site workers. The quantity of water required by a mine depends on its location (geology, climate), the mine's service life, its size and the type of ore extracted as well as the mining process used. Effluent can be acid or alkaline and may contain dissolved metals and organometallic complexes generated by the treatment of ore, or naturally produced with organic substances such as long-chain humic acid and carboxylic acid from mining operations. Environmental risks from mining are increasingly taken into account. For example, acid rock drainage ( ARD ) is generally associated with sulphide ore (such as Pb, Zn, Cu, Au and other ores) which reacts when in contact with oxygen and water producing acid effluent, loaded in metals and sulphates. This is a long-term problem faced by the mining industry and sometimes carries on long after the mining of the deposits has stopped. The steel industry covers iron and steel manufacturing from ore.
Four discharge groups can be defined for integrated iron and steel plants. 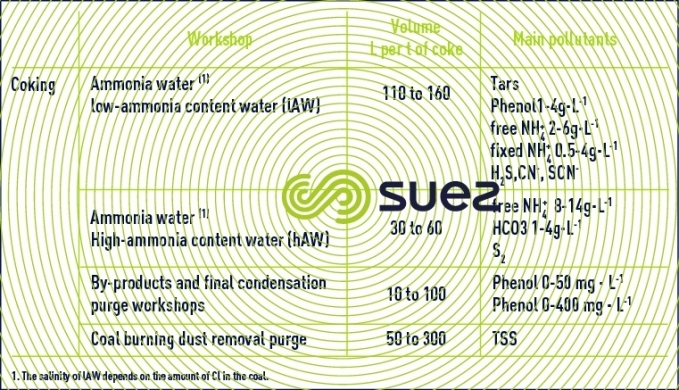 Coking generates water containing ammonia which comes from the moisture in coal (8 to 15%) and formation water (3 to 5%) generated during coal burning. This is low ammonia-content water, rich in phenols. Gas scrubbing generates high-ammonia content water, rich in free NH4. This concerns the agglomeration workshop, blast furnaces (and direct reduction) and steelworks. In most plants, circuits are semi-open and only low blowdown need to be treated. The pollution that must be treated for recycling purposes is mainly made of suspended solids. In order that they comply with discharge standards, blowdowns have to undergo more complex treatment processes. Following continuous casting and bloom scarfing, up to the creation of products (strip mills, bar mills, four-high rolling mill, wire mill, tube rolling mill) water is involved in a whole series of mechanical operations, descaling, cooling of machinery (rolls) and metal (by spraying). This leads to the formation of oxides (scaling) which may contain small quantities of pollutants (hydrocarbons, grease, fluorides) from lubrication of frames or steel. The presence of dissolved pollution is rare (hydraulic fluid leakage from continuous casting or rolling). All these circuits can therefore be semi-open with a low deconcentration blowdown to be treated. Certain cooling circuits are not in direct contact with the coolant (gas or metal). In this case, these circuits may be managed in the same way as standard, semi-open type cooling circuits, requiring blowdown operations to maintain salinity in the loop. Nevertheless, the atmospheric environment being sometimes dusty, extra care needs to be taken in the management of suspended solids. In total, make-up water in a steel plant which is well-fitted with recycling equipment, can account for 3 to 6 m3 of water per tonne of steel. 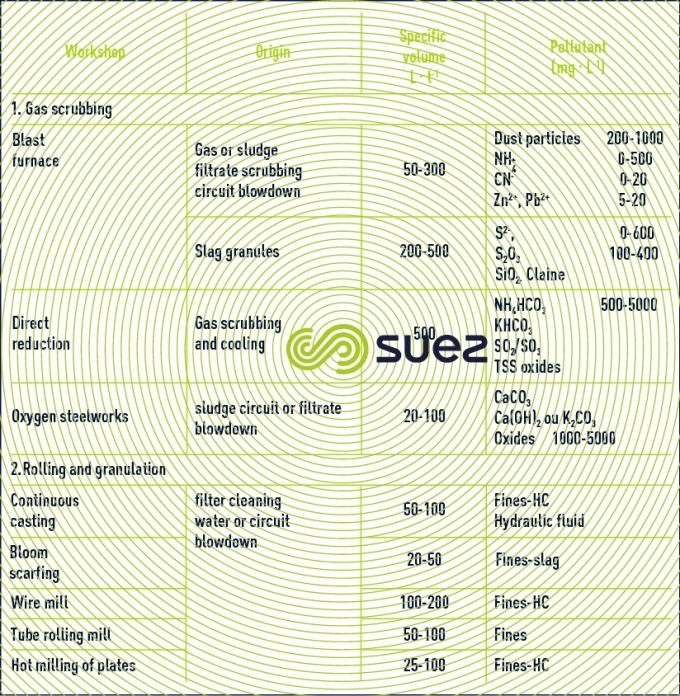 Given a global concentration factor of 3 to 4, the total volume of effluent in the semi-open circuits is then 1 to 1.5 m3·t–1 of steel (table 66). stripping: this produces highly polluted rinsing water containing Fe2+ and, if sulphuric acid is used, H2SO4. If hydrochloric acid is used­, which has become fairly generalised, thermal regeneration of HCℓ may remove a large majority of acidic and dissolved iron discharges. Each of these operations must in itself be followed by current flow rinsing. cleaning water with moderately concentrated chemicals likely to precipitate (soaps, grease, metallic salts). 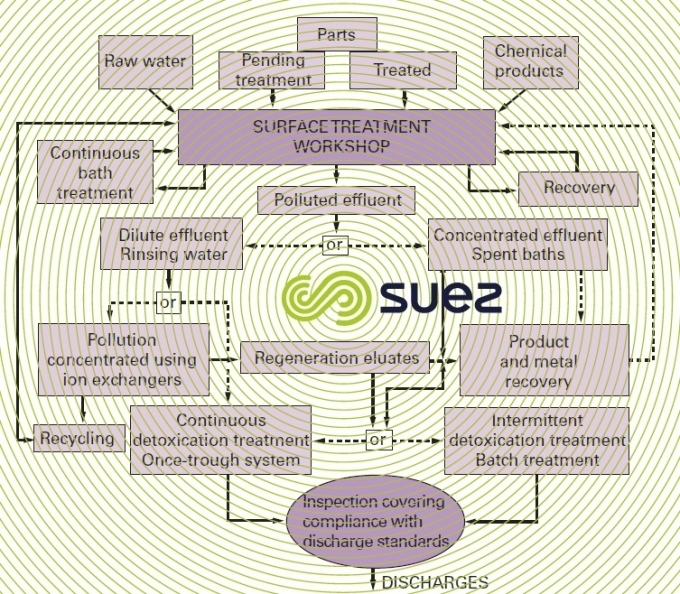 diluted rinse water and which may be recycled following treatment. As much as for safety as for making treatment easy, the acidic and chromed effluent must be separated from alkalines and cyanides. pollutants which are subject to special legislation, S2–, Fe2+ . organic pollutants (EDTA…), in particular coming from grease removal operations. All of a bath compounds are found in the rinse water which may also contain metallic ions coming from the parts which have been treated. cascade rinsing, possibly with recycling using ion exchangers. 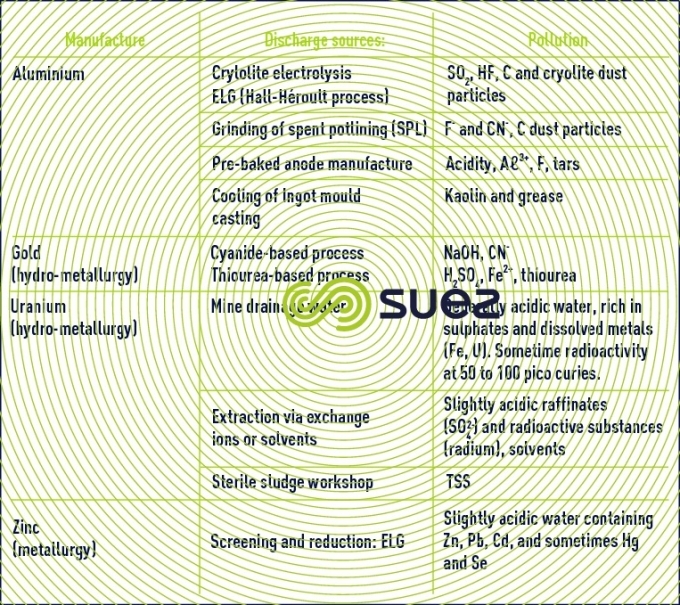 electrolysis (Cu, Zn, Cd, Ag, Ni…). In economic and environmental terms, this last method is the best. A reverse osmosis concentrating treatment process may be worthwhile, either before electrolysis, or to "lift" the baths.